Pericrocotus igneus Blyth, 1846, Malacca. Sometimes considered a race of small minivet (P. cinnamomeus) but is morphologically distinct and marginally sympatric. English: Small minivet; French: Minivet flamboyant; German: Feuerrotmennigvogel; Spanish: Minivete Chico. 6-6.5 in (15-16.5 cm); 0.5-0.6 oz (14-16 g). 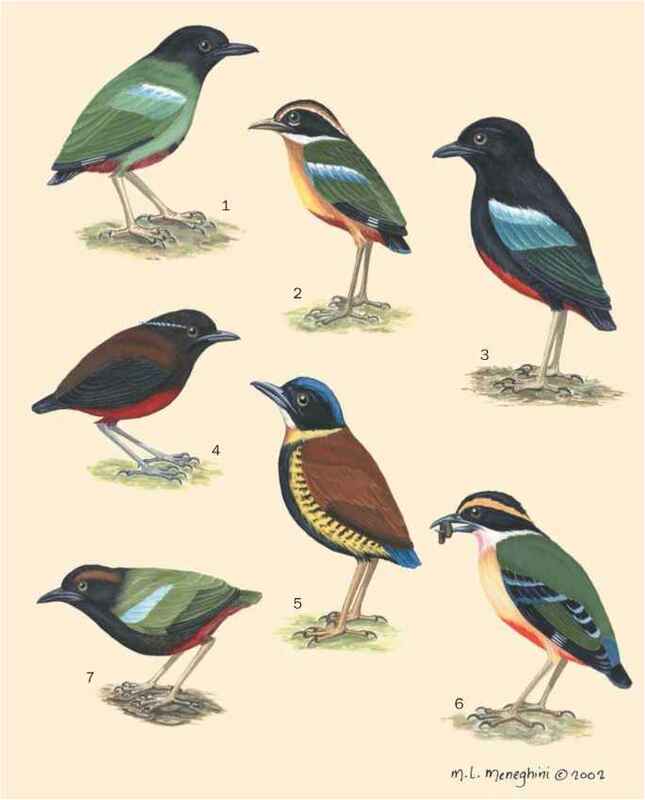 Male has black upperparts and throat with red breast, belly, rump, and outer tail feathers. Female has gray upperparts with orange rump, yellow underparts, and black tail. 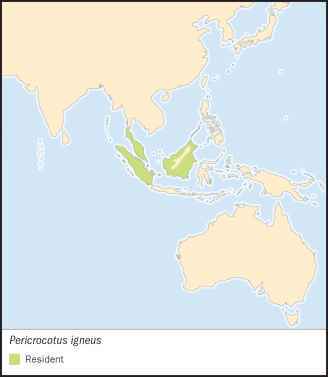 Malay Peninsula (south Burma, south Thailand, Malaysia), Sumatra, Borneo, and southwest Philippines (Palawan). Canopy of forest and forest edges; also pine plantations and ca-suarinas. 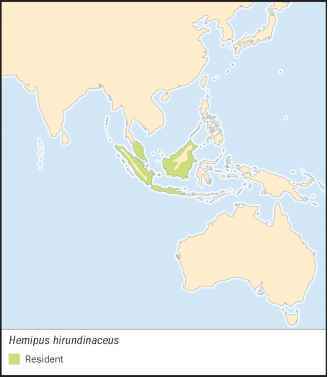 Occurs in lowlands, but lives in montane forest up to 8,900 ft (2,700 m) in Sumatra. Not specifically described; probably insects, especially caterpillars and moths. Forages in the canopy. Probably monogamous. Breeds in Palawan in December (dry season) and in Malaysia in May (start of rains). Nest is not described; probably as for small minivet: a cup of fine twigs, stems, leaves, lichens, and spider webs on a tree branch. Lays two eggs. Not threatened. In the 1980s-90s regarded as locally quite common in Palawan and Sumatra but uncommon in Thailand.